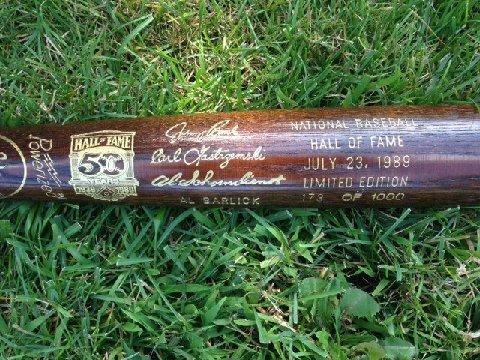 In 1989 the National Baseball Hall of Fame celebrated its 50th Anniversary with the inductions of game greats Johnny Bench and Carl Yastrzemski - both first Ballot inductees. 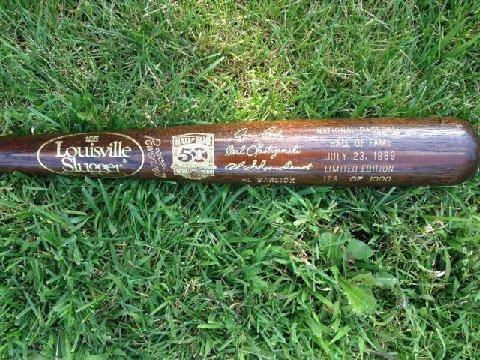 That year Louisville Slugger released the Limited Edition 50th Anniversary Commemorative Bat. This bat is from that series (173/1000), and would make a great addition to any collection. Get it today for your very own. Due to the rare nature of this item we must charge your credit card for the full amount immediately upon taking your order. This policy ensures we reserve the bat for you. We will confirm your order by Email. This bat is not game used. Please allow at least 2 weeks for delivery. 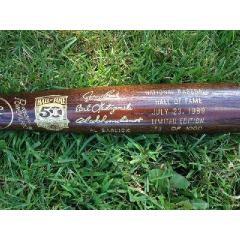 Hall of Fame 50th Anniversary Commemorative Bat $595.00 Sold Out!